The couple met at a jujitsu tournament in Las Vegas, Nevada. He was there to coach, and she was there to watch. She had no idea that he had seen her at the jujitsu gym for several months and had wanted to talk to her. After that night he searched her on Facebook and added her. After she added him back on Facebook, she realized that they were from the same hometown of Kingman Arizona, a small town 100 miles away from Las Vegas! There was not a day that went by after the tournament when they didn’t speak. A few days later, they had their first official date at Skinny Fats, and he asked her to be his girlfriend. Things were starting to get pretty serious soon between them. She come from a traditional family, and informed him very quickly that he would have to get permission from her father to marry her. It would be her dad who gives her away at the wedding after all. Over Thanksgiving, they decided to take a road trip to Oregon to meet his mother. Little did she know, he had already spoken with her father and had even bought the ring! He just wanted one final thing before asking her to marry him: he wanted her to meet his mom. On their first day in Oregon, he told her that they were going to hike to a waterfall near his mom’s house. They get to the waterfall, and he just took off running on the trail with the dogs. She was so confused as to why he is leaving his mom and her behind. They eventually catch up to where he is in a perfect spot in front of the waterfall. She smiled about how handsome he is standing there waiting for her in front of this gorgeous site. He then gives his mom his camera to take some pictures of them. She still has no idea what is going on. He even gets down on one knee and starts fumbling with a jewelry box and she still can’t even believe yet what is happening. He finally tells her that he loves her and wants to be with her forever. It finally clicks that he is proposing and of course she say yes! Than a couple of months later we had our Engagement session at Mt Charlestion, what is about an hour drive from Las Vegas. 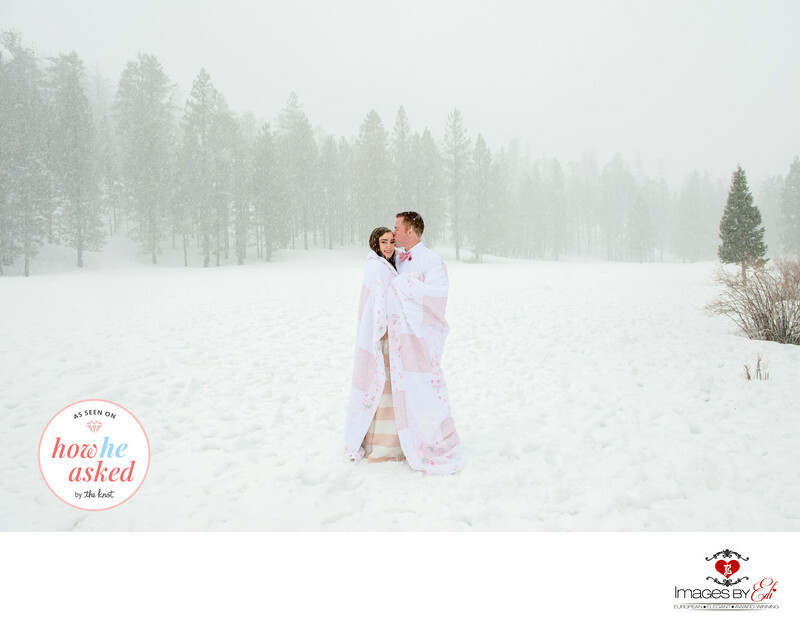 We ended up in a snow blizzard during the photo session. It just didn't stop snowing for hours. The funny thing is, that on their wedding day it was almost record heat, 120 F.